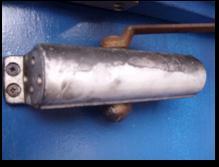 Leaking Closers are a maintenance problem that often may go unnoticed. When a closer leaks it presents a potential hazard to those entering and exiting a doorway. The oil inside the closer drips down and can make floors extremely slippery, not to mention staining clothing and personal belongings of those passing beneath the closer. More importantly, when the oil drains from the cylinder, the closer's ability to control the door is lost. If this were to occur, the door swings freely and will start slamming and could lead to personal injuries as well as costly damage to the door and frame. In the case of floor mounted closers it is harder to spot if the unit is leaking as it is with concealed transom closers which are mounted in the head of the frame. Both these units are usually fitted to doors that open both ways. If you have an armour plate glass door in your building you will have one of these two fitted. If they start slamming then you need to contact us immediately as this can have serious repercussions. The door could break and these are very expensive to replace. 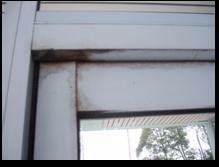 If you see any of the signs of oil leakage as shown in the photos then contact us for a free quote. We can rectify the problem before injury or damage occurs. Leaking door closers are only one of many possible causes of doors not closing correctly. Door alignment and other worn or faulty hardware could be the cause. 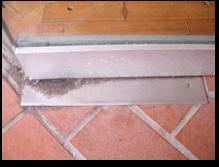 Click on this picture to see what can happen when an armour plate door is not maintained correctly!